Starting off fine today, as was yesterday, but i think the wind has dropped somewhat. i really noticed how strong it was yesterday when i was bringing my auction paintings home. i've had a busy week, quite unusual for me. i started off quietly with my grocery delivery on Monday and then jumped into high gear on Tuesday with lunch with my dear friend Mark. Lovely to see him; been a while. i'd timed his visit with the open day at Cheffins, my local auction house, which gave us something to do after lunch. He hadn't been there, so it was a good learning curve for him and let him see how fascinating it is. Truly everything from A-Z goes through auction houses and ours is quite typical. i had gone through the online catalogue the night before, as i usually do and draw up a list of interesting things, which neatly cuts a lot of time from my visits. 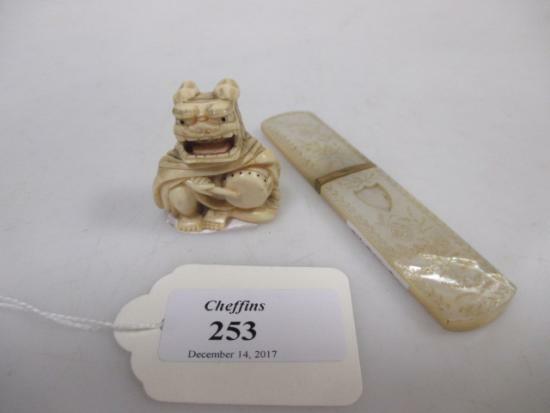 We had a good mooch around and i found a delightful little netsuke of a boy [you can't see his face in the photo] in a Chinese lion-dog skin sitting on the floor, beating a drum, teamed with an exquisite mother-of-pearl needle case. Didn't think i had a chance at it, but decided i might bid for it and see how much it fetched. Lots of lovely bits of silver - no chance to buy any of those as the silver boys are usually out in force, as usual. Several paintings caught my eye and surprisingly, i actually did very well with those on the day for very reasonable prices - except for one, which was a bit pricey. Wednesday, i went to the doctors to check up on a couple of lumps/moles whatever on my right cheek and met one of the new doctors, Dr Ali [who turned out to be Indian]. He had a learner student with him and explained to her why certain things show up a red flag; getting bigger, changing colour and so on, and why on inspection, my lump could be a cyst or something more dangerous. He filled out the form to get me an appointment on the spot, explaining to her as he did so. He said they should get back to me within a couple of weeks, even in the short time before Christmas, and he was right. i had a letter yesterday setting an appointment for 19th, next week! i was surprised at the speed, i must say. So more on that later. Thursday, sale day, jammed packed with many lots but very quiet people-wise. Quite a few jeweller-types there as what looked to be a whole shop load of jeweller's stock was on sale - everything from loose gems to the usual items, huge amount. i actually got the little netsuke (30mm x 33mm) but had to wait a long time until the paintings came up and spent some time in their little cafe reading. i went back into the sale room for the lots i was interested in and was surprised how many lots were not sold. 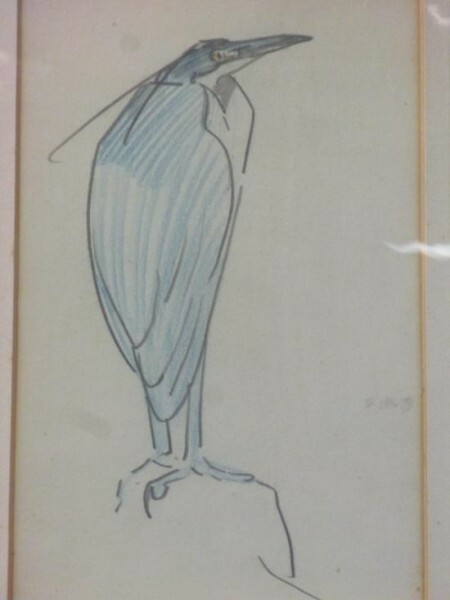 i got a big folio of prints, water colours & drawings [i'd had a good look through on the viewing day] for £20, as i was the only person bidding. The lot i paid the most for was a couple of bird watercolours, a Blue Heron (48cm high x 31cm) & a little Brown Kestral, which inevitably someone else wanted too! 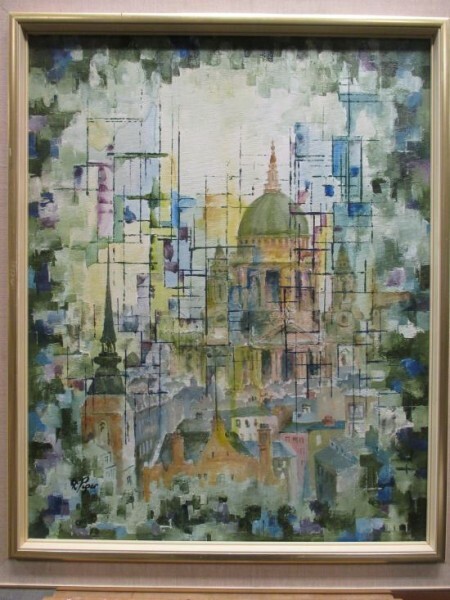 It was the two of us bidding; actually a commission bid, but i wanted it more. The other two pictures were quite big but a lot more in my price range and i think the size of them could have been a factor. The Chinese one (only £50!) is 186cm wide x 55cm - i know!! The one of St Paul's was a lot more manageable size at 90cm x 29.5cm wide. You would have laughed like a drain, had you seen me struggling home with them! i made it though - where there's a will, there's a way! i didn't take them home that night as i was going to see 'The Last Jedi' and took them home the next day. Friday - my birthday, 70 at last. 75 is my next milestone, outliving my Mum - then 85, outliving my paternal grandies. After that, i'm still working on living forever! i had a good day, first collecting my auction goodies and then out for dinner with Anna. She was only just recovered enough to make it, gladly, having got over flu which caused her to feel quite ill and take to her bed. Anyway, we had a very nice Christmas dinner and some wine. Jamies have my birthdate and give me a bottle of presecco every year. One of my favourite waiters sang Happy Birthday to me! i don't drink it but give it to Anna, who does. Only downside to having dinner in a popular place, the NOISE! People making merry in Very Loud voices and screams of laughter. i'm glad they enjoy themselves so much, but do they HAVE to be so obnoxious! i found it very hard to hear normal conversation and had to cup my ear a lot to hear Anna - would a hearing aid magnify the crowd too? This morning started out nice and sunny but has slowly clouded over and now at 2.30pm is looking increasingly like rain. Mind you, i wouldn't be surprised if it snowed again, it's pretty much cold enough. i'm not too bothered either way, i only know how cold it is as i filled up the birdseed a little while ago. Friday Five a day late. FB 'Star Wars: the Last Jedi' - About half an hour too long and aimed at the kiddies with lots of fights and bangs to keep them happy. i guess i'm pretty jaded now and like some more substance to my story, like the Blade Runner sequel, which i'd like to see again. 'Jedi' had lots of nods to the first film but the villains were like cardboard cutouts in comparison and really not scary at all. Best for the girl-power themes and Daisy, Carrie, Laura Dern and little Rose carried the film for me. Faugh! what do i know - go see it for yourself. I really love your Chinese painting. It's lovely. Not a problem, all wishes welcome, however belated! The painting really is lovely, isn't it? i could not resist it and nobody else was THAT interested, so i got it at such a good price. Seriously, i nearly fell off my chair!